Betsy McCall paper dolls were a feature in McCall's Magazine . 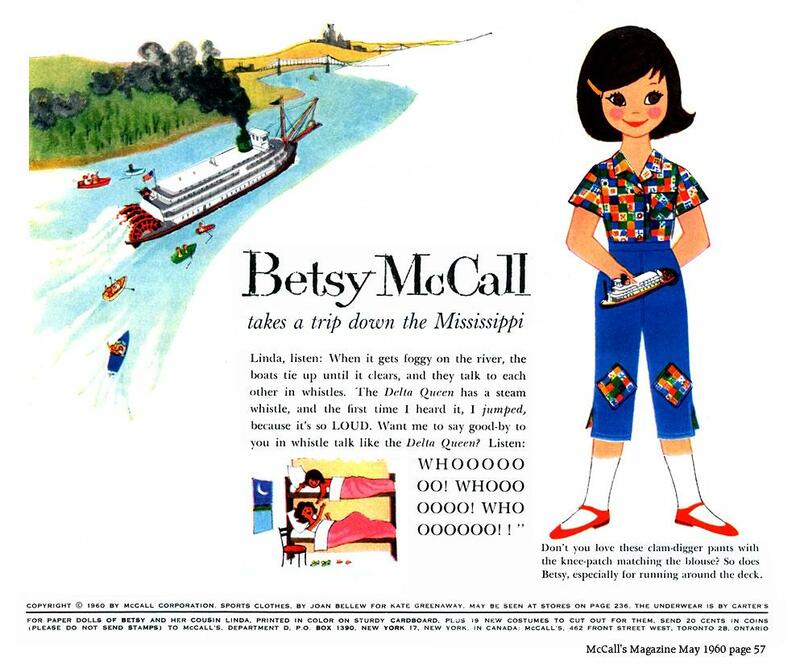 . . this one from May 1960 used the premise that Betsy takes a voyage down the Mississippi on the DELTA QUEEN and calls her cousin Linda when the DQ lands in New Orleans to tell her about the trip. The reference to a "real Pirate's Cave" has to refer to Cave-in-Rock on the Ohio River in Hardin County, Illinois. In addition to the composite that I made is a small scan of the whole page which you don't necessarily need to include. This page includes a color graphic of Betsy in her "skivvies" and three "outfits" with tabs that could be cut out by little girls. I put Betsy in the clam-digger outfit since she's holding a toy DELTA QUEEN in her right hand in that one. McCalls offered this set of paper dolls "printed on sturdy cardboard" plus 19 others for only 20 cents mailed to McCall's Dept D in New York or Toronto. When the river boat Delta Queen landed in New Orleans, Betsy phoned her cousin Linda: "Hi, Linda! This trip is the most fun! We sleep in bunks, and our bedroom is called a stateroom. We were in a real Pirates' Cave, and we visited a plantation and some mansions. Our boat is called a stern-wheeler because it has a big wheel at the stern—that's what they call the back, and port is the left side, looking forward, and starboard's the right—and the stern wheel churns up the water like a giant egg beater. The captain let me visit him in the pilothouse. He pointed out boats from all over—an oil boat from Europe, and barges with new autos from Detroit, and a motorboat from Florida, and houseboats with people living on them. They fish right from their own decks. You know what? 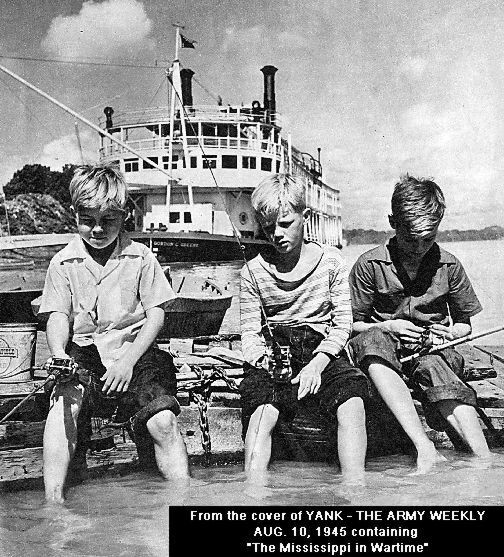 I talked to one family on the captain's ship-to-shore telephone. They invited me to a catfish dinner. No, I don't know whether a catfish meows, but I don't think so. Mommy and I are going sight-seeing in New Orleans, so I have to stop. Linda, listen: When it gets foggy on the river, the boats tie up until it clears, and they talk to each other in whistles. Motor Boating, The Yachtsmen's Magazine, January 1934. 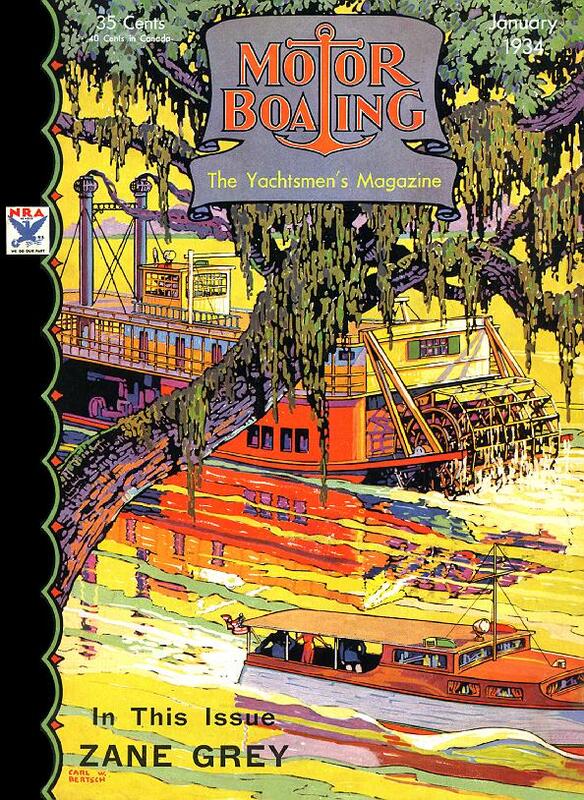 I believe that the artist who did the cover art based the boat on the Amy Hewes, which ran on the Bayou Teche in Louisiana. There's a celebrated photo of her which I'll have to locate for you (also a colorful silk necktie used that photo) The photo in question was taken from a low angle so the artist who did the Motor Boating cover had to imagine her from a high angle vantage point in order to get this perspective. 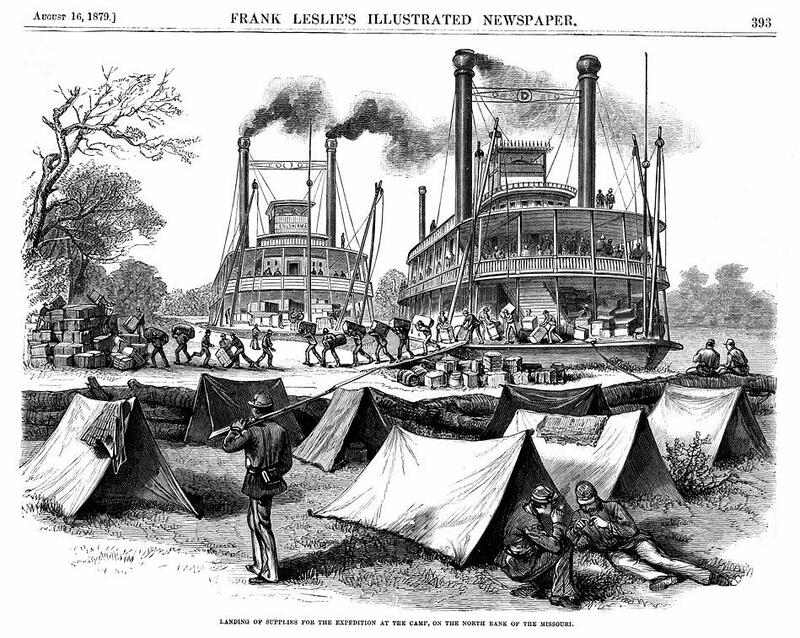 1879 Frank Leslie's Newspaper illustrations of 2 steamboats which must have transported troops, weaponry and other supplies (the one on the left is the GEN'L SHERMAN) for a U.S. Army expeditionary force under General Miles that was in pursuit of Chief Sitting Bull during an "Indian Campaign in Montana" on the north side of the Missouri River. 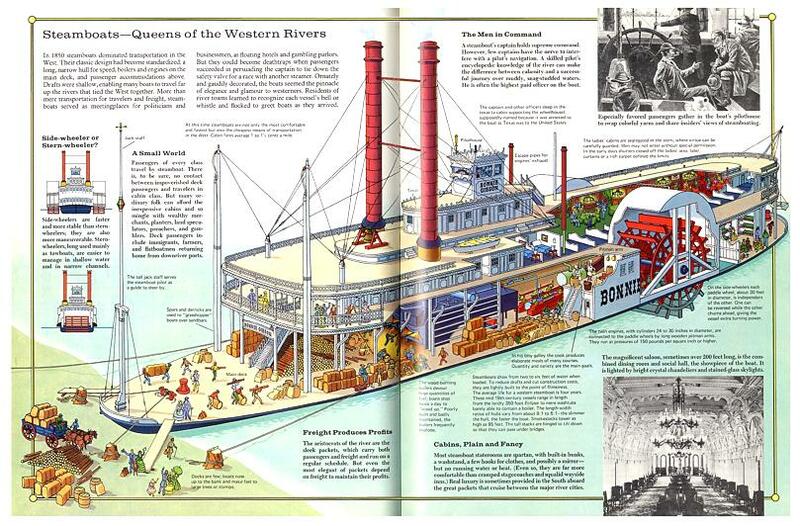 ATTACHED READY TO USE FILE OF THE DOUBLE PAGE SPREAD FEATURING ARTWORK OF A CUTAWAY OF THE GENERIC SIDEWHEEL STEAMBOAT THAT THE ARTIST CALLED "BONNIE GIBSON" - FROM THE 1987 READER'S DIGEST EDUCATIONAL BOOK "STORY OF THE THE GREAT AMERICAN WEST." Got to thinking about the Chris Greene in that illustration. In 1947 she was "withdrawn from service" according to Fred Way, so I imagine the date on that painting was more likely mid 1940's. The eBay seller listed it as being from HOLIDAY magazine but the illustration style is much more typical of FORTUNE magazine. There's no name or date on the backside of the page to say where it came from. This same magazine page was taped to a Dutch door in the "clip art" room at the Disney Studio and I always admired it and was pleased to finally come across it listed on eBay. Detail of cover from August 1945 YANK magazine. (U.S. Army publication). Nostalgic scene taken near Owensboro, Kentucky. Nice pix of the Greenes in the article . . . (see next two pages). While Murnane talked, the "Illinois" lay in the water sluggish as a dying creature. Fifty feet from the dock she lost headway and commenced sliding back with the current. Murnane wheeled toward the pilot house like a flash. "Now, Hi," he shouted. "Now give it to her, give it to her." The engines answered with jar upon jar, the steamer hung still, then moved ahead again. The black river washed over the main deck and joined the river rising in the hatches. The "Illinois" lurched to port, feebly grazed Dubuque dock, and sank like lead in eight feet. The decks were slanting like toboggan slides, the fires drowned, the engineers and the deck crew up to their necks, Davis fast in the pilot house casings, and we St. Louis fellows hanging by our nails to the remnants of the cabin skylight; but Murnane, braced on a chimney guy, was as gravely watchful as though his steamboat was landing in a twenty-foot harbor with a stiffs water foaming at the bow. "Get out your head and stern lines, lively, Tim," he ordered. "I want a spring line too." Burns's men, wet, but grinning, scrambled out of the river and 'ashore with the hawsers, and drew them taut on the mooring piles. "All solid, sir," sung Burns. Murnane looked back for the "Sultana"; she was just emerging from the drawbridge. Turning again to the dock, he picked the Mayor of Dubuque in the crowd. 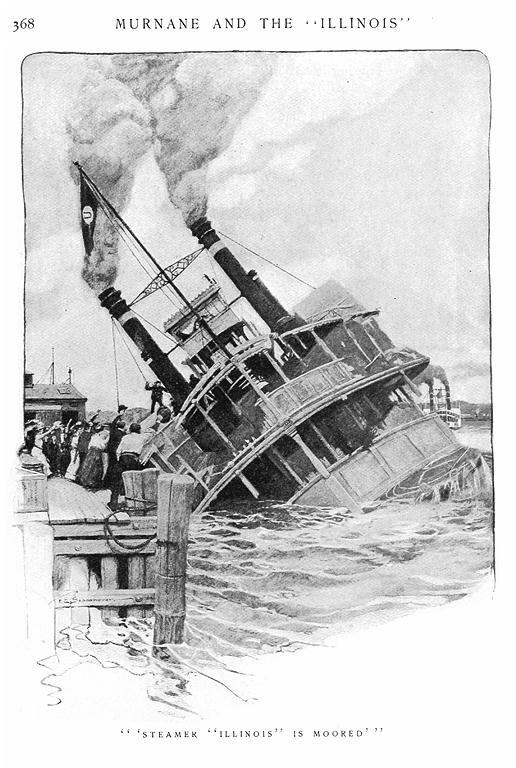 Steamer "Illinois" is moored," said Murnane, solemn as a judge. "I believe the articles specify: The first boat to tie up.'" "Correct," returned the Mayor, just as solemn. Found this on Etsy, had never seen or heard of it before. 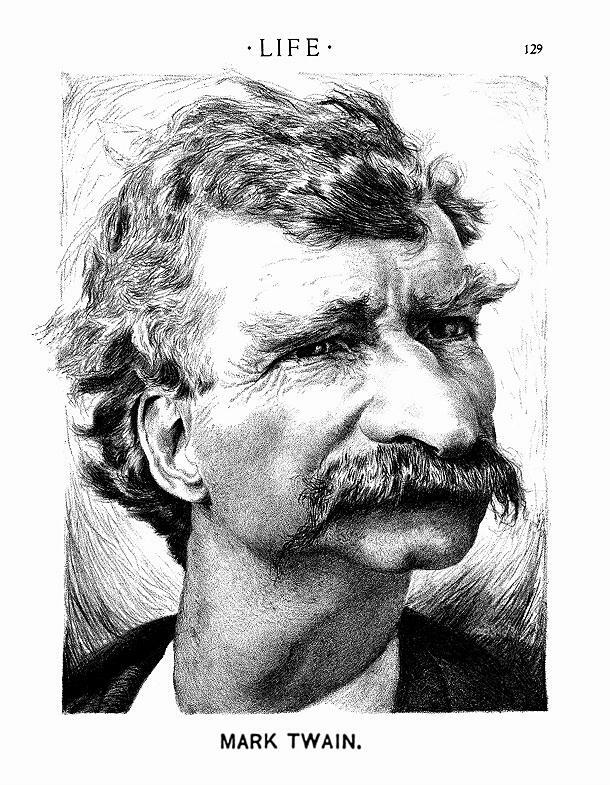 Page 129 of the original LIFE magazine August 18, 1898 Mr. Sam Clemens MARK TWAIN looking rather like a drawing by the extraordinarily entertaining French artist Honoré Daumier 1808-1879. The LIFE artist isn't identified but he may have been influenced by Daumier. There was a paragraph on the opposite page about Clemens that was intended to be "funny" but instead pretty much nonsensical and not worth including. 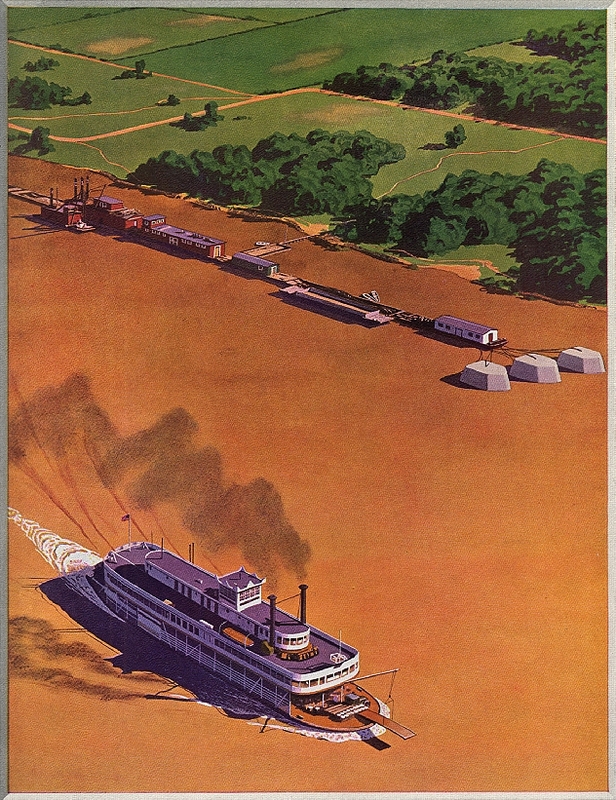 I LOCATED MY WATERWAYS JOURNAL BOUND ISSUES FROM JANUARY TO JUNE 1955 AND TO START OFF WITH I SCANNED PAGE 32 FROM THE 8TH JANUARY AND REFORMATTED THE BANNER LINE ACROSS THE TOP; ADDED IN THE UPPER MISSISSIPPI TOWING CO. AD FROM LOWER ON THE PAGE WHICH WAS THE OTHER AD OF INTEREST BESIDES THE CINCINNATI REGALIA CO. 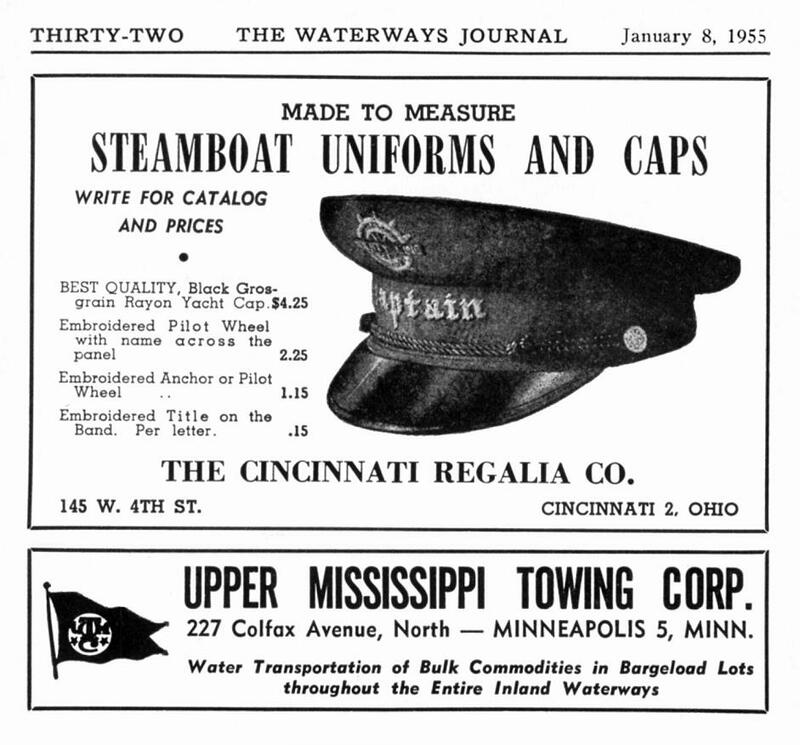 AD FOR STEAMBOAT CAPS AND UNIFORMS. I WAS JUST A KID WHEN THE REGALIA CO. WAS ADVERTISING HERE, WISH I HAD KNOWN ABOUT IT AND HAD A PREMONITION TO DIP INTO MY ALLOWANCE TO BUY CAPS AND UNIFORMS SO I'D HAVE SOME IN MY COLLECTION DURING FOR MY "GOLDEN YEARS." THERE IS SOME OTHER INTERESTING CONTENT IN THESE ISSUES THAT I'LL SAMPLE FOR INCLUSION IN OUR PAGES.